Red is in. If you haven't noticed, there's a huge marketing campaign pushing the purchase of certain red objects in order to support the fight against AIDS in Africa. The most notable is the Apple's sale of the new Red iPod. Their website entices consumers noting, "You make choices every day, from the clothes you wear to the music you play. Now making a choice means making a difference." 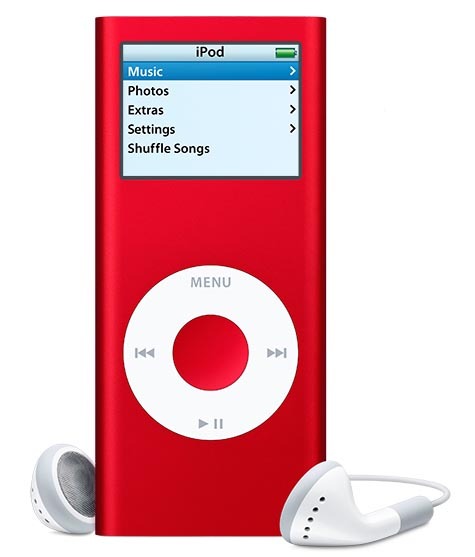 The purchase of one of these iPods yields $10 to the Global Aids fund. Many other "hip" companies are marketing similar "red" products in support of the cause. You might think that this is a great idea- that these companies actually care about something other than making a profit. But, paint me red and call my cynical, it's just not true. "An overwhelming 74% surveyed indicate they are more likely to pay attention to a company's overall messages when they see that the company has a deep commitment to a cause. Nearly nine out of ten Millennials surveyed, ages 13-25, stated that they are likely or very likely to switch from one brand to another (price and quality being equal) if the second brand is associated with a good cause." In short, if you claim that your product donates some profit to a worthy cause, then young hipsters will run to buy it. This brings about an interesting paradigm shift in marketing. Even though we're still in the midst of a consumer-driven society where your purchases define who you are, people are starting to realize that there's something more to life than serving self. There are people in the world who are in desperate need, which leaves us feeling guilty for buying things. Therefore, if you can tell us that our purchases make the world a better place then not only don't we feel bad, but we're actually being productive. Hence [I should copyright this]: iPurchase Because iCare. Do you see how demented this is? It's a "have your cake and eat it too and while you're at it, eat that starving kids piece of cake" mentality. And numerous companies are already starting to use this fact to woo shoppers. Example 1: Last month I saw a commercial for Macy's with Susan Sarandon telling about a unique sale the story was having. On a given weekend, the store was donating a certain percentage of their profits to a cancer fund. She encouraged us to "make a purchase to save a life." Well, your husband was in Shawshank Redemption and you were in Thelma and Louise, so if you say so . . . Example 2: Last week, on my off day with Kaelyn, I was watching TV and caught a glimpse of the Rachel Ray show [had to watch a couple of minutes because this chick is being called the Oprah of Generation Y]. She was telling the audience that they should pay $100+ dollars for a pair of jeans so they could help fight breast cancer. Selfless. You gotta believe that no more than $5 per pair would go the foundation. So if you're that passionate why not pay $30 for a cheap pair of jeans and give the rest to the charity. Or get even more pious and keep wearing your old jeans and give the whole enchilada to the cause? I'm not overtly idealistic here; I'm not advocating that we all need to adopt a ascetic lifestyle. But let's be realistic here: we're being duped by these companies into believing that they care. The M.O. of for-profit companies is to turn a profit. And if they can do so by getting you to believe that you're making the world a better place by purchasing their product, they'll do it in a heartbeat. "I'd like to teach the world to sing . . . "
Don't get me wrong: I'm a Mac guy. I love using Apple products. But I just won't buy [pun intended] their whole "we care about the world" schtick. This trend signals that we're entering into a new stage of marketing: the "we're more pious than our competitors stage." It should be interesting to see where this takes us. So red isn't really what's in. It's still green.